The Yakima RocketBox 11 Car Top Cargo Box features a very long and narrow box that does not need a lot of space on your crossbars. This lengthy design provides sufficient room for snowboards, skis and it still has more than enough space for the poles and boots. The ABS construction is quite durable and can take much of Mother Nature’s seasonal abuse. The Rocketbox has a versatile clamping system and can easily fit on moat factory crossbars, round and square crossbars without the need for adjustments. This uniquely designed roof top box is made from 80 recycled content. Unfortunately, there is limitations as to where this product can ship to. Though it is available in 48 states, roof top boxes cannot be shipped to Alaska and Hawaii. Installation of the Roof Top Box requires no tools. Comes standard with Lifetime Warranty. Nicely fits on crossbars measuring 30 – 36 inches. Measures 89 x 22 x 14 inches, equivalent to 11 cu. ft. and weighs 35 pounds. 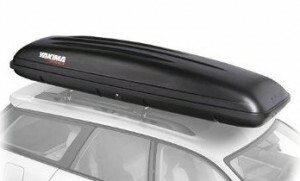 The Yakima Rocketbox 11 Roof Top Box was only reviewed by 7 customers, but for the number of people that reviewed it, they gave some really positive comments. Out of 5 possible stars, the Rocketbox 11 received 4 and a half. Everyone all agreed that it does provide a lot of space and that it fit nicely on their vehicles, however there was one person that said it was too long. He may have been referring to the rear when you open up the back. This is something to consider for anyone that has a hatch back or sedan. Many liked the fact that it did not rattle or cause any noise when driving. When you first open the box, it may feel flimsy, but it seems to be a normal thing for boxes in the same class. But, once you install it and firmly secure it, then you don’t need to worry anymore. Though it doesn’t have the same thickness as some of the more expensive models, it still comes with a 100% warranty in case there are any problems. That’s one thing that can’t be beat. One reviewer remarked that it did everything that was advertised. It was spacious, easy to install and doesn’t eat up all rooftop space, which ultimately provides flexibility. One thing that this reviewer would have liked to have seen was for the top to be a little firmer, in his terms he said that it “flexes” which makes it a little sticky. Others liked the price you pay for the top box. Compared to some other top boxes on the market, you don’t have to pay as much money to enjoy the extra space, especially if you like to go camping or like to go for weekend getaways with friends or family. You really do get your money’s worth and more. You can really fit in a lot of things. One person said they were able to fit 2 pairs of skis, 3 snowboards and 3 pairs of boots. This person did hit the hatch on opening, which was also reported by another reviewer, but it was expected and didn’t cause too much stress for them. What Is ABS Plastic, And What Does It Have To Do With The Automotive Industry?